What kind of metal band does Pictures of Pain want to be? After the first several songs and then a full spin of The Reckoning, this was my question of this Norwegian metal band. Not forgetting that this Scandinavian country put black metal on the map, I guess we should expect something of that sort here. However, that would be an unnecessary rush to judgment. There's much more metal going on here: traditional metal, thrash metal, melodic metal, power metal, black and death metal. The foundation is probably traditional thrash with just about everything else tossed in. Vocalist Hans Helge Iversen has a range of metal versatility from clean to scream to hellish growls. So, indeed, there is some Norwegian black metal. But are we to conclude with this amalgam of metal that Pictures of Pain is a progressive metal band? Why not? Let's run with that. From the start, with Betrayal, Far Beyond, and Eternal Rage, I was hardly impressed with PoP's dark and brooding metal mixture. Mostly, as noted above, I didn't know where the heck this music was going. But once you catch the breadth of the vocal arrangements, Iversen's versatility, and the depth of the guitar solos within accelerated and technical arrangements, you begin to get what PoP is doing here. Then, though one might still pass on the first three songs, momentum builds on this work. Sign of Times, The Reckoning, and the incredible Final State deliver the goods: blistering melodic progressive metal with enough nuance to intrigue the most seasoned metal fan. 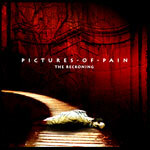 With my earlier reservations somewhat removed, Pictures of Pain's The Reckoning is a solid debut of intelligent, compelling, and satisfying progressive metal. Pictures of Pain's The Reckoning is a solid debut of intelligent, compelling, and satisfying progressive metal.